2019 promises exciting developments for Scotland’s property market, off the back of multiple findings suggesting the region’s potential for investment and development. Scottish property outperformed its five-year average in 2018, as commercial investment reached £2.5bn thanks to increased involvement by some big UK funds and continued high interest by overseas investors. Mid-year, Scotland was found to be the best performing market in the UK, growing by 5.6% compared to Wales’ 4.4% and England’s 3.7% growth over the same period. The upshot of increased investment is a set of development projects which look to usher in a new era for Scottish urban life. Cultural centres, retail units and residential property are all springing up to meet a demand for a higher standard of amenities in the region. This is especially true for major centres like Edinburgh, in which ambition and performance of building projects currently underway could set a precedent for future development around the country. The highest profile of these is the Edinburgh St James redevelopment. Located in the heart of Scotland’s capital, between Calton Hill and St Andrew Square, the project has an opportunity to combine culture and commerce for the benefit of occupants and visitors, driving the long-term success of owners and investors. The scheme comprises a world-class retail, leisure, hotel and residential offer, including Scotland’s first W Hotel, first boutique Everyman Cinema, a flagship John Lewis department store and 150 apartments offering unrivalled amenities and views across the city. TFT’s role as Project Monitors on Edinburgh St James is to ensure the planning, design and construction of the development proceeds by resolving challenges at an early stage and by protecting the budget and timescale of the work. In major works like this, that role is crucial given extensive excavation and replacement of existing infrastructure in and around the site, and working around an open department store – John Lewis – without disruption. And it’s not just retail, leisure and residential sites which are pointing towards growth. TFT’s Edinburgh office is working on a combined 376,705 square feet of major office schemes on behalf of Legal and General in in Edinburgh and Glasgow. 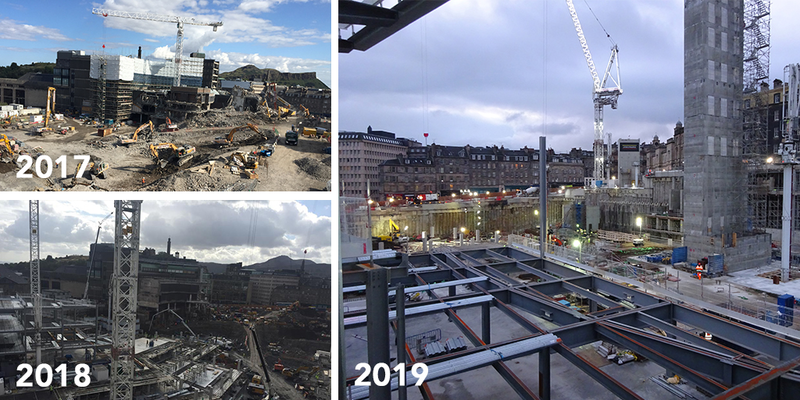 The skills to navigate these challenges will only be more in demand as development continues around Scotland – whether it’s in a busy city centre, redeveloping older sites, or breaking ground in a new site, careful management of the project will be crucial to maximising its success. On a recent site visit, we saw the major changes afoot, and the new St James centre taking shape. With Scotland’s national growth also looking strong for the future, we’re excited to guide subsequent works that drive its success. The challenges of obsolescence turning liabilities into assets effective proofing. The Future. Where are we heading? What does the future hold? Meeting tomorrow’s challenges.